The more I look into it online, the more I’m thinking I’m lucky to have got my hands on a bottle of Death’s Door Whisky. First of all, the spirit isn’t mentioned at all on the company website and second, according to their blog it seems they have little distribution beyond the Midwest. Well, I thank Astor Wines & Spirits for getting it in stock! That said, the reason I’ve been frequenting Astor of late is because my usual go-to shop, LeNell’s, had been on something of a hiatus. To my great disappointment, that hiatus became permanent not too long ago. We’ll all miss you, LeNell, come back to Brooklyn any time! …and Astor better start stocking some more new and interesting stuff like this Death’s Door because I’ve just about had everything there. Back to the subject at hand. What makes DDW stand out above all else is the fact that it’s clear. 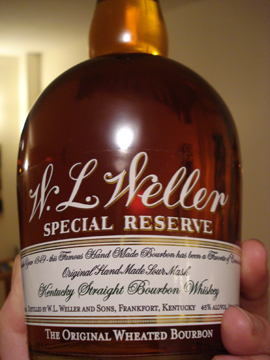 Its description at the store says it has been aged in steel drums, then for a day or two in oak casks, but nothing more. This has me expecting something only slightly less harsh than the fresh-off-the-still taste of something like Georgia Moon. Where it could differ though is in the fact that it’s made with a 100% wheat mash, which I could see softening some of the sharper edges you’d see in a fresh corn whiskey – but still-fresh is still-fresh no matter what the mash. We’ll see. Ah, beautiful simplicity. If you’ve read a few of my past entries, you’ll know that one of my frequent complaints about whiskeys are their over-done label design. Death’s Door takes the radically opposite approach with their clear bottle, clear label sticker, and absolutely minimal use of text. The only adornment is their double D logo. Otherwise the vessel serves only to tell the whiskey aisle shopper that its contents is indeed clear and still a whiskey. In certain contexts this minimalism could be interpreted as pretense, but sitting on the table in my apartment, it just looks clean and serious. Yep, as you might expect, this smells like fresh distillate. 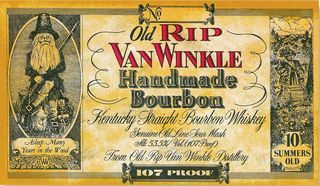 The harshness is a little muted from what its peak no doubt was, but I don’t know whether to chalk that up to bringing it down to 80 proof, the brief aging period, or both. Difficult to make out anything particularly wheaty like you might whiff in something like Bernheim. Generally a pleasant nose though. When drinking, the first sensation is sweet and dry: raspberries and the smell of sun-bleached driftwood. There’s a good deal of warmth on the palate for something this young and it’s surprisingly smooth. The berry/driftwood sense continues throughout, then fades into a slightly bitter, short-lived finish. This is a good one. Definitely a change of pace from your usual line-up of brown liquors and surprisingly different from the Georgia Moons of the world. As for how to drink it, putting it on the rocks might mute the more delicate flavors beyond repair, but adding a drop or two of simple syrup and some mint might not be a bad idea to compliment DDW’s strengths. It’s not an all time favorite, but I have to say I’m impressed what they’ve done to make an enjoyable white whiskey and it’s a worthy addition to anyone’s cabinet if they’re looking for something that’s a change of pace. I met Ralph Erenzo – co-founder of Tuthilltown Spirits – at a tasting at Fermented Grapes this weekend. I’ve tasted TS’s barley Single Malt before and I’ve been curious about their Four Grain Bourbon more or less since. So, after tasting some of TS’s apple vodka and Baby Bourbon (as well as a pleasant conversation with Ralph) I took home a bottle. As I’m sure I wrote before with the Single Malt, Tuthilltown Spirits squat little bottle with wax-dipped top is attractive for its lack of affect and medicine-bottle look, while avoiding the kitch and nostalgia of other American whiskies. My only complaint is the wordiness of the paragraph on the back, which belies the rest of the packaging’s simplicity. On the nose FGB is very muted. There’s a bit of spicy, pepperiness from the rye as well as a sweet maple syrup scent. The first sip enters smoothly and sweet, then develops a full-mouth grainy, grassy taste. It’s here where it reveals some youth though (it’s aged less than a year in small barrels) and a little tartness, but it slowly moves into a medium-length peppery finish. Tuthilltown’s Four Grain Bourbon is pleasantly full. If I didn’t know it had been aged less than a year (Mr. Erenzo let that out) I probably wouldn’t have been able to guess. I’m looking forward to what they produce in the future. 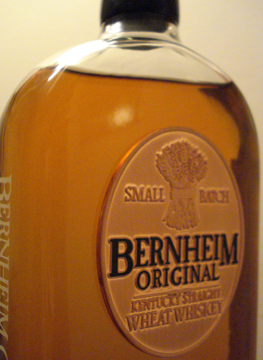 When it comes to wheat whiskey there’s usually one name that comes to mind above most others – Bernheim. So this week I finally took the plunge and gave it a serious look. The bottle is less than two inches in depth and uses minimal labeling. One side sports a faux-aged sticker with some text, but this is blissfully out of the way. Otherwise the main descriptive elements are the heavy copper-colored name plaque in the center of the bottle front, and the design of the bottle which lets light pass pleasingly through the yellow-amber colored liquid. Focus here is on the drink and its attractive qualities rather than any semi-truthful origin stories. That’s the way it should be. The nose is mostly mild, with hints of honey, dry grass, and hazelnut coming through. The honey is very much what I expected – the hazelnut is a bit of a surprise. To the palate Bernheim absolutely screams “wheat!” when you first take it in. This quickly transforms into notes of unexpected spice, nuts, and green apples. Really quite complex, but not slow at all in its development. The flavors themselves may not be to aggressive, but they develop as though chased by hellhounds. This turns into a lingering, pleasing spiciness. Bernheim is definitely not what I expected it to be. I was thinking I’d find a mild honey-driven whiskey, but instead was confronted by a hyper-active, but no less interesting drink with some surprising spice. One thing that I found a little odd was how at points it reminded me of Glenfiddich – mostly at the height of its green-appley moments.